Honor The Dream on Monday. Then try to create a new one on Tuesday. The day after next week’s Martin Luther King Jr. holiday, Transportation Alternatives will send an armada of activists to Albany to lobby straggling State Senators and Assembly Members to support Gov. Cuomo’s congestion pricing initiative, which would reduce Manhattan traffic, save lives and fund crucial subway repairs. Ironically, the group needs drivers to ferry activists to the statehouse. Still, the issue is a win-win for lawmakers: Congestion pricing supporters say it will raise $1 billion annually for the transit system, which can then be leveraged into $15 billion in capital funds. The system needs at least $20 billion in repairs [PDF]. Some legislators — like Helene Weinstein of Brooklyn and Andrew Lanza of Staten Island — say they oppose congestion pricing because it would penalize drivers in their neighborhoods, but statistics show that only a tiny number of “outer borough” commuters drive into Manhattan regularly, and the ones who do tend to be far wealthier than their transit-using neighbors. The request for drivers is a reminder of our poor transportation system between the city and the state capital: Amtrak runs sporadic, costly service. Putting five activists in a car ($50 in gas, tolls and maybe some fish sandwiches at the Arthur Treacher’s in the Plattekill rest stop) is far cheaper than sending them to Albany on the train (total cost: $225-$375, plus another $13.75 if you include a can of soda for each, given that Amtrak’s cafe car charges $2.75 per can!). Volunteer drivers will be reimbursed for fuel. Interested drivers should contact Yamada by clicking here. The first idea of congestion pricing that would lower tolls at other bridges, in order to eliminate toll shopping was a much better choice. This new plan is just a cash cow, so that the MTA can continue spending in ridiculous amounts, such as the most expensive mile of subway in the world. Tomorrow Riders Alliance will lead a rally outside Cuomo’s Manhattan office to demand that the governor and legislators include congestion pricing in this year’s state budget. All Aboard! Now Even Rodneyse Bichotte Says She Supports Congestion Pricing! The Assembly Member's change of heart provides a look at how congestion pricing moved from unlikely to very likely. Congestion Pricing Opponents Reveal They Are Completely Out of Ideas — And Easily Flustered, Too! Assembly Members David Weprin and Rodneyse Bichotte tried to rally opposition to Gov. Cuomo's toll plan, but ended up getting shouted down by scores of supporters of congestion pricing. Q&A: Will Carl Heastie Lead on Congestion Pricing? Don’t Count on It. 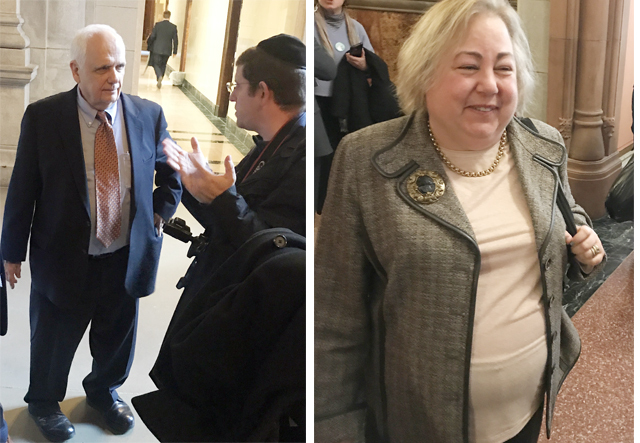 Streetsblog spoke with the Speaker on Wednesday in his Albany office.